Today saw the Channel crossing of a fully electrically powered aircraft, Airbus’ E-Fan, F-WILE. Which makes me wonder when large commercial airliners will crossing the skies. But anyhow, this is a start. According to Airbus’ roadmap in 2018 a commercial E-Fan 2.0 will be ready for market, followed in 2019 by a slightly larger E-Fan 4.0. See also my older post on the Paris Airshow 2013. The E-Fan is not the first to cross the Channel. Yesterday Hugues Duval, with his modified Cri-Cri F-PZTU, was. Taking off on top of Broussard F-GDPX, a combination known as the Breton Shuttle, a development from the 90s by his father, Yves Duval. It was 10 years since my last visit to the Paris Air Salon. And though the weather was not that good, and though many aircraft already had left, it nevertheless was an interesting collection of aircraft. A handsome small all-electric concept plane whose first flight is scheduled for the end of 2013 (note: actually 11 March 2014 F-WILE). F-WATT is a mock-up. More information at the EADS website. With 472 km/hr reached on 7 June 2013, X3 is the fastest helicopter on earth. It first flew on 6 September 2010. More information at the Wikipedia X3 page. Clearly based on the succesful P.180 Avanti, the Hammerhead is an UAS (Unmanned Aerial System) for reconnaissance and surveillance missions. It first flew remotely controlled on 12 June 2013. More information at the Piaggio HammerHead page. The nEUROn is an Unmanned Combat Air Vehicle (UCAV) for which development was launched in 2003. It first flew on 1 December 2012. More information at the Dassault nEUROn page. The Ka-52 Alligator clearly demonstrated its versatile flying capabilities due to its coaxial rotor system. It is a two-seat combat helicopter, based upon the Ka-50. First flight was in 1997, and production started in 2008. The Russian Army and Navy have ordered over 140. More information at the Russian Helicopters page. It took me quite some time before I had figured out how to upload from Access 2010 into my online SQL database that is feeding these pages. Finally, last July, I succeeded. But only recently I did find some time time to upload. The good news is that most data, which I use to generate the log reports, is now available on line. But a lot of work to remain is in uploading the pictures of my 2010 and 2011 trips. To show at least some pics, here are some taken during a visit to the Dugny side of Le Bourget in Paris, September 2010, where many surplus Musée de l’Air aircraft are stored. And where there are also a lot of restauration projects going on. Very interesting location to visit! As a bonus you also get a nice overview of bizjet activities, which even include large aircraft like Airbus 340! The next day I stumbled upon an Open Door Day at Persan Beaumont, which I did not know about. Very nice opportunity to visit this interesting airfield north of Paris. Last May I was present at the Tiger Meet 2011, with a lot of great opportunities for taking pictures. Who would have thought years ago to watch Polish F16s participating? Nor Greek and Turkish aircraft side by side? 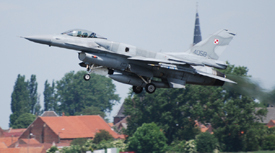 Polish F16 4058 taking off at Cambrai 20110511. And last to highlight is a recent ealy morning flight from London City which I always find a pleasant airport to use. THE big change since my last visit was that now both BA and Lufthansa are extensively using their Brazilian jets instead of their Avrojets. Not difficult to predict CityJet and Swiss will sooner or later also start using these nice and handsome aircraft. It is the Brazil jets now dominating this airport. One of the Boys from Brazil, G-LCYL, at London City Airport. Now and then I wonder if it would not be easier to use the standard PICASA or FLICKR tools, to name some. But then, I want full control over the way my pictures are represented. And of course, if you are interested in higher resolution copies, please contact me.